Spring is the perfect time to do a little fashion inventory to your closet. Perhaps at this point you have already done some spring cleaning around the house or are planning to in the next few weeks. Sure the trends indicate that clutch bags and satchels are two favorite styles right now. Still, who doesn’t love a classic, functional tote handbag. Today we want to introduce you to the ‘Scarlett’ tote bag by a California based company, Robert Matthew. When we received the Scarlett tote bag in cream it was easy to see that this handbag had all the makings of a go-to option. First, we put it to the test by loading it up with as many necessary items as possible. In this case we added a wallet, makeup bag, pair of sunglasses, cell phone, keys, a kindle, a fashion magazine, a bottle of water and a pair of flats. Everything needed to get through a busy work week and it held all the items with room to spare. This tote is made of soft vegan leather, includes a gold studded detachable shoulder strap plus two handles for variety and ease of carrying. When you open the bag you will find compartments with zippers and a pinstripe interior design. This bag retails for $199.00 and certainly works for a fashionable busy lady on the go and for travelers. If you are a bit on the petite side the bag might seem slightly oversized so make sure you consider the measurements which are 15″ W x 12″ H x 7″ D. The one minus was that although the interior pinstriped design was nice, the polyester lining felt a bit too plastic. The turn lock feature with the zipper at the top of the bag was quite welcome and gave a feel of security. So handbag lovers if you are looking for a tote bag that has style, is fashion forward and functional then consider this bag from the Robert Matthew handbag collection. Leave us your comments below and please make sure you share this post with the social buttons below. 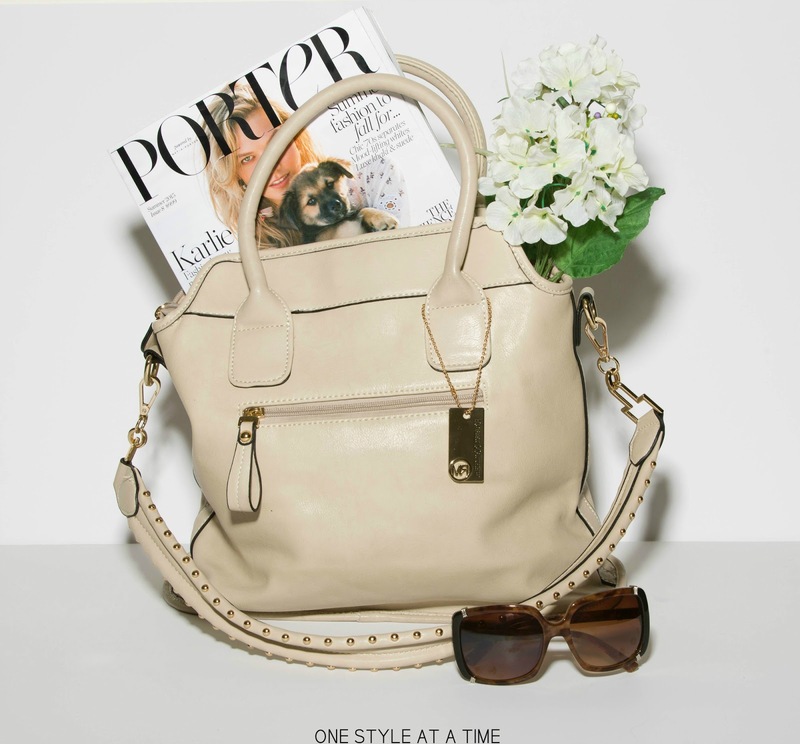 One Style at a Time Review: A good functional tote bag with significant storage features and on trend style. One Style at a Time product score: Out of five style hearts we give Robert Matthew 4 golden stars. Disclaimer: I received the Scarlett tote bag for the purpose of this review. All thoughts are my own.